I'm such a fan of the American Horror Story series, so I decided to do this look today. It's more complex than it looks. It takes a lot of patience, and a lot of layering. Each layer of paint has to be dried before you add the next. I would say I did about 10 layers of paint to get it extremely white. The products I used were Mehron's white liquid, and black paint. MAC white cromacake paint, and sclera contacts. 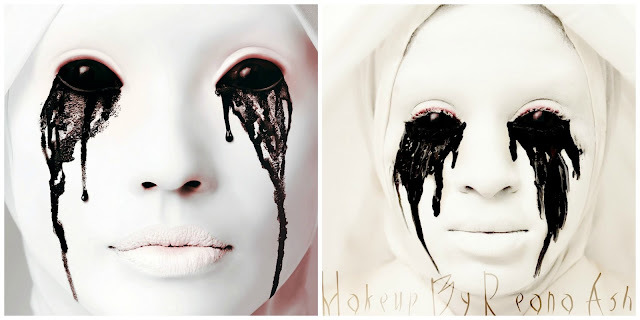 The sclera contacts are very expensive, but they're needed to achieve this look. To make my eyes run I added Mehrons black paint into drops, smudge it then took a spray bottle of water, and sprayed the black paint to make it even runnier. I hope you guys like this look. I'll be doing a tutorial soon, so you can achieve this look for Halloween. Don't forget to tune in to FX October 17 to watch the new season of American horror stories! Don't forget to comment, and let me know what you guys think about the new season. I would love to follow! Whats your blog? Thank you so much for liking my work, and thank you for nominating me :p!! I will sure to check out your blog. Great work!!! would you like to follow each other by Bloglovin? I would love to! Whats your blog? Holy smokes ... you are amazing! I cant even. This is so good I'm actually a little creeped out (its also midnight for me right now so that doesn't help lol). You have a new fan!